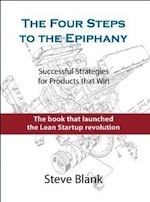 You may have read my previous posts about the Lean LaunchPad entrepreneurship class. 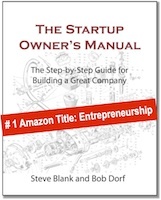 The class teaches founders how to dramatically reduce their failure rate through the combination of business model design, customer development and agile development using the Startup Owners Manual. Just a crazy idea two years ago, the class is now taught at Stanford, Berkeley, Columbia, Caltech, Princeton and for the National Science Foundation at the University of Michigan and Georgia Tech. And in the thirty days since we’ve put the Lean LaunchPad class online at Udacity – 50,000 students have been taking it. While the Lean LaunchPad online has received rave reviews (it’s being translated into Spanish, French, Russian, Japanese and Greek, and it’s being used as part of a “flipped classroom” in other entrepreneurship courses), it’s different than taking the class in person. It doesn’t require you to form a team, and there’s no immediate instructor feedback. More importantly, it makes no demands of you to stand and deliver your weekly customer development progress in front of your peers. In sum, it lacks the rigorous and collaborative hands-on experience that entrepreneurs get in our university classes. We thought long and hard about how we could take the Lean LaunchPad Online to the next level and deliver the same level of experiential instruction to tens and hundreds of thousands of entrepreneurs around the world. The result – Startup Weekend Next. Startup Weekend Next is a four-week version of the Lean LaunchPad class with hands-on instructors and mentors – and we will teach it in hundreds of cities around the world. I’m partnered with four great organizations to deliver the program. The class is organized, led and delivered by Startup Weekend, the global non-profit that teaches entrepreneurs how to launch a startup in 54 hours. They’ve hosted close to 800 Startup Weekend events in over 350 cities worldwide educating a staggering 57,000 entrepreneurs who’ve created over 5,000 startups. Today they are going to take Startup Weekend to the next level by organizing and teaching a four-week version of the Lean LaunchPad class as their Startup Weekend Next course. Their reach and scale means our goal of helping to create 10,000 startups is within our grasp. In addition, the leading experts in building entrepreneurial companies and regions, TechStars and Startup America are partnering with us in this endeavor. In the U.S, Startup America will leverage its network of 30 startup regions to engage entrepreneurial leaders throughout the country. And TechStars will use its broad and unparalleled network of mentors (experienced entrepreneurs and investors) to coach the teams. And Udacity has put their awesome production resources behind the class and hosts the Lean LaunchPad online lectures. And we are looking for other partners worldwide to help make this successful. The first four-week Startup Weekend Next classes will start on Nov. 28 in more than 25 cities worldwide. The program expands to all of Startup Weekend’s 350 member communities in 2013 where it will be offered up to five times a year in each city. The cost of attending a Startup Weekend Next is ridiculously inexpensive. It doesn’t take equity and just has a small fee that varies by city ($140 to $299), to cover event operations and expenses. We now know how to crack the entrepreneurial code by creating an Entrepreneurship API – a standard language for entrepreneurs. When you leave the class, you’ll know how to think about your startup in the now standard “language” of the business model canvas. You’ll understand the customer development process used to test those hypotheses and learn how to iterate or pivot when your hypotheses need to change. And you’ll learn about how to build a minimal viable product to get feedback early and often from customers. Here’s how the four intense weeks in a Startup Weekend Next class works. Your team gets live coaching and advice from Startup Weekend Next mentors. You’ll take the suggestions from the meeting, get out of the building and talk to ten plus customers per week. You’ll refine your business model by iterating or pivoting your product, your target customers, pricing, channels, partners, etc. Repeat for four weeks– all while working with volunteer mentor partners from Startup Weekend, Startup America and TechStars – serial entrepreneurs and seasoned startup investors – to see whether your business idea was truly a vision or simply a hallucination. 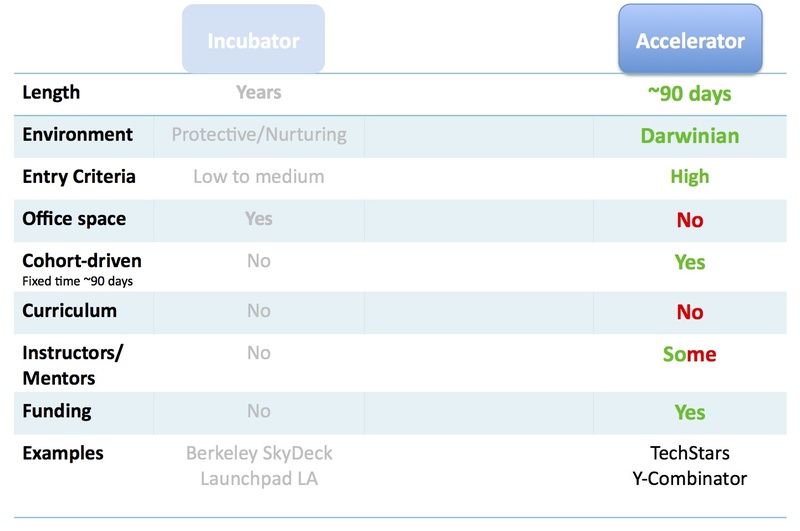 In contrast, the goal of an accelerator is not physical office space, it’s a fundable company. Startups enter and leave as a cohort (starting and ending the program at the same time) in a program of a set length. While there is no formal curriculum, most offer weekly expert lectures, experienced mentors, coaching and introductions. Accelerators provide funding at the end of the program. 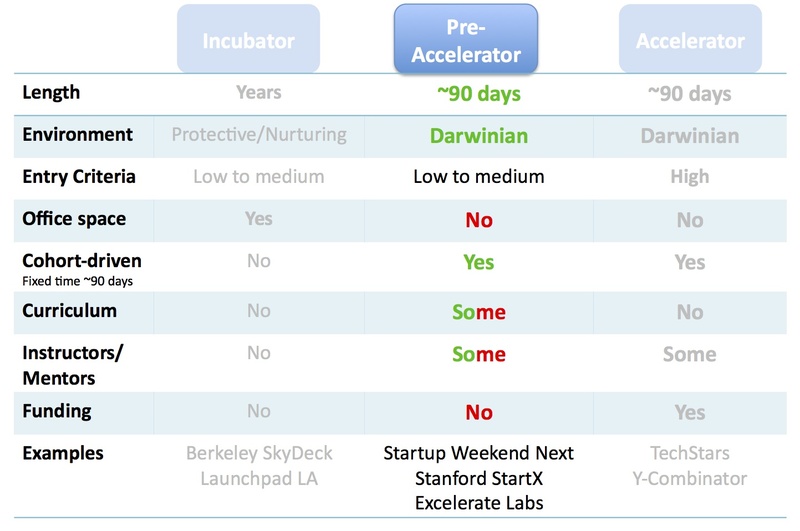 Getting into an accelerator is more competitive than grad school. Startup Weekend Next represents something new – a pre-accelerator. Like an accelerator there is no physical office space, and startups enter and leave as a cohort in a program of a set length. But the key difference is that Startup Weekend Next engages you in a formal curriculum. We believe we know what startups need to learn, and we focus on teaching you that. Instead of guest lecturers, you get out of the building and you learn by doing. Like the best accelerators, you get experienced mentors, coaching and introductions. Unlike accelerators, there is no funding at the end of the program. But you leave knowing a lot more of what it takes to build a company beyond a PowerPoint deck for a VC presentation. You’ll learn about the business model canvas. and wait until you see what we do next. Awesome, it is exactly what the Startup Weekend needed to have a more effective impact in newer communities. Thank you. This is really great Steve. Thank you! Hey Steve – Entrepreneur is spelled incorrectly on the homepage of the nexxt website (swnext[dot]org). Would love to incorporate startupplays.com in this program. Thanks for catching that Scott. We will get that fixed right now. So, is this aimed as a “Start Up Crash Course”? If so, this may be helpful and save me time. Fantastic! Will this also include physical channel startups? Would love to get involved! Foodcubator, Inc.
Steve – curious as to why Excelerate Labs is listed as a pre-accelerator. It looks like they self-identify as an accelerator, more similar to Techstars and Y-Combinator. The definitions have been fuzzy over the last few years as these programs emerge. One of things that are beginning to differentiate “accelerators” from pre-accelerators is whether they offer funding at the end of the program. I would draw a line in the point when you need to commit full time or not. In newer startup communitites there is a real need for part time programs, since there aren’t many success stories out there there’s a lot of uncertainty and fear in quitting your day job when you have no idea of how to build a business and probably bootstrap it. I see it as something between the “entrepreneur for a day” of Startup Weekend and the fulltime entrepreneur. The world still doesn’t know all that much about entrepreneurship, but some of the things we do know are being made accessible which is so exciting for us. While we won’t be able to scale Steve himself around the globe, this model will deliver Steve’s curriculum in a highly effective, experiential way in communities around the world. Thank you for the post Steve and all of your help putting this program together! Looking forward to seeing everyone else at an event. I am an Austrian entrepreneur in the health care space, part of the Udacity community and have been following the development of the Lean Launch Pad now for more than a year. I am really excited about the recent developments and would like to establish the Startup Weekend Next in Vienna, Austria. Austria needs more entrepreneurs and entrepreneurs using the right technology to get their businesses started. Could you please let me know who would be the person(s) to talk so that I can establish this effort over here. Go to the http://swnext.org/organize/ page. Absolutely awesome idea, thanks for continuing to pour your time into this. iCorps was unquestionably the best startup educational program I’ve had a chance to participate in and the structure and length of this program will help spread the meme wider. I’ve had a chance to work with some of the accelerators and investors here over the past few months; this type of program fills a much-needed gap in the ecosystem. I moved to Beijing, China this year and will start doing the ground work for organizing a Next program here next year. Will be back in Silicon Valley in early December, happy to help you out with anything while I’m in town. Excellent. This is a really exciting evolution, Steve! Scaling to the next level!! Just signed up to be a facilitator. You do need to photoshop a token girl in your Shake the World logo. Thanks. I was happy to be able to just be barely competent enough to put the logos on the old Soviet propaganda poster. How about you be my official photoshop expert for the next image I do! Hi Steve – we are running this for veterans who’ve served in combat in partnership with SCORE here in Tampa Bay. We do not have quite the funds for $175 a student. Would you please let us run the SW Next/Udacity course for them? 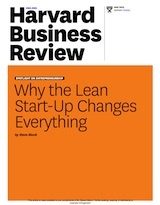 I teach Lean Startups already. Thanks! Anyone is free to use my class on Udacity. Steve, Do you have plan to do this in Nashville, TN or Chattanooga, TN ? That’s up to you. 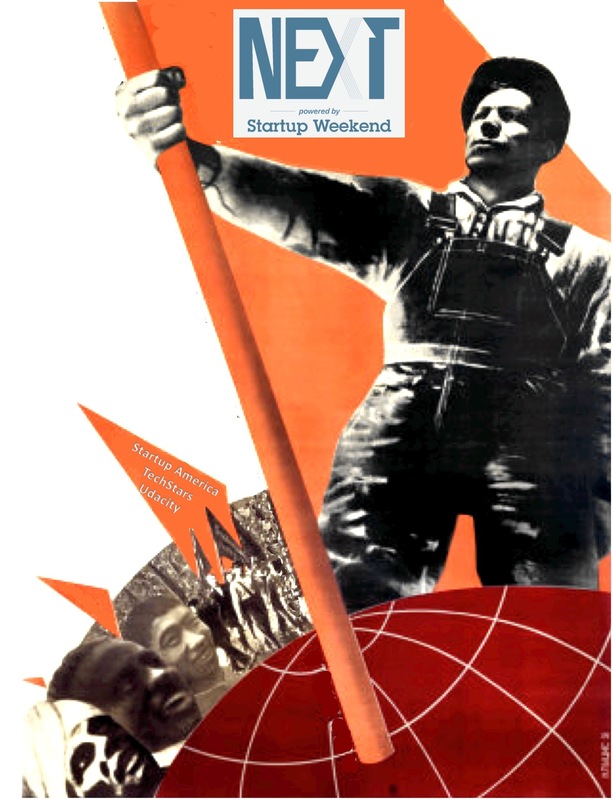 Startup Weekend Next requires 30 participants and a volunteer organizer and facilitator. Steve, this looks great. How many people (which roles) do you recommend for the minimum viable team for Startup Weekend Next? Looks like you have one on deck for Denver, Colorado. 3) Hire you as an advisor / coach? “Oh great… more content”, thought I, “Who’s going to be able to deliver on that promise. Let’s just take a wee peek.” Wrong! Just signed up. Awesome. Thanks Steve. 1. How different is the environment for start-up entrepreneurs in California cities than it is in NYC? There is always the image that entrepreneurship in the California cities is more glamorous. Younger, hipper, experimental, digital nomads, easier access to capital, board meeting in pajamas and so on. In your experience, is it necessarily true? I’m in NYC and the mind wonders. 2. It seems as though the explanation of Startup Weekend Next could be simplified/clarified a bit. The impression is that it is going to be awesome(lots of content), but for some reason it is hard to understand what the roles/responsibilities are, what the course includes and so on. Also there seems to be strict requirements for organizers. (no nyc event yet) Somehow it is just difficult to understand. This is just be my take on it looking at the website. I am without coffee this evening. Thanks for inspiring and educating a lot of entrepreneurs. We would like to participate in Startup Weekend Next, from Chennai, India. How can we do that? Thanks Steve. Appreciate such a quick response. I would like to recommend your Startup class to my Spanish speaking colleagues. Is there a time-frame for when the material will be made available in Spanish?